BRIDGEWATER, N.J., Oct. 23, 2018 /PRNewswire/ -- October is breast cancer awareness month, a time when thousands of people around the world participate in events aimed at supporting breast cancer patients and research into a disease that remains one of the leading causes of death for women in many parts of the world. At the same time, science has made tremendous strides in the fight against the disease. Despite an increasing number of diagnosed cases (among women and, extremely rarely, men), over the last 20 years advances in diagnostic techniques and an increase in effective treatment options have significantly improved breast cancer survival rates. If discovered early enough, more than 90% of patients will survive at least five years post-diagnosis. 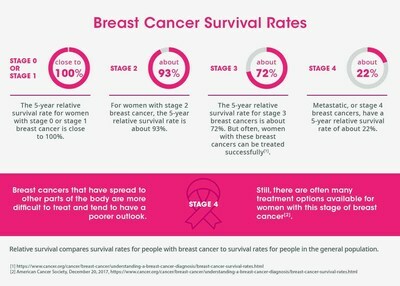 Overall survival rate for breast cancer vary worldwide, but in general survival rates have improved because cases are diagnosed at an earlier and localized stage, and improved surgery and adjuvant treatment (additional cancer treatment given after the primary treatment to lower the risk that the cancer will come back) options are available1. Much of the progress made concerning breast cancer survival rates has resulted from research that has revealed breast cancer as a far more complex disease than was imagined just a few years ago. As scientists have decoded the human genome, they have been able to learn much more about how cancer works and how it interacts with the body's immune and hormone systems. 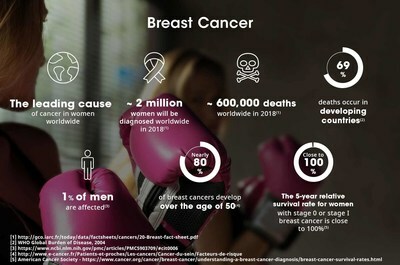 "Our view 20 years ago was that there were two kinds of breast cancer: pre- and post-menopause," said Laurent Debussche, Head of Sanofi's Molecular Oncology Research R&D. "Today with our understanding of human genetics and our ability to analyze massive amounts of data, we can see that there are many more variations – and also better understand how to target them." Shortened radiation therapy techniques have been developed. Instead of patients being placed under an external beam of radiation for 20 to 30 days, rods, beads or small balls containing radiation materials are inserted in the operation site for a few hours or days2. This is done during an operation for breast or prostate cancer. Genetic testing gives people the chance to learn if their breast cancer or a family history of breast cancer is due to an inherited gene mutation. About 5% to 10% of the breast cancer in some women is due to anomalies in the structure of a number of genes, such as BRCA1 or BRCA2 mutations3. Women in families where breast cancer has been diagnosed may consider having their genetic profiles analyzed for the presence of these rogue genes, which allows early preventive measures to be taken. Clinical trials have been an important step in discovering new treatments for breast cancer and providing new ways to detect, diagnose, and reduce the risk of disease. More clinical trials have been developed and completed showing the benefits of specific chemotherapy agents and what combinations could be more useful. Targeted therapies the rapid advance of knowledge in genetics and molecular biology is the foundation for some of the most promising research into breast cancer treatment today. This knowledge is enabling scientists to work toward the development of "targeted" therapies that attack a specific variation of breast cancer. Targeted therapies block the growth and spread of cancer by selectively interfering with specific molecules that trigger its growth and spread. This is a marked change from radical surgeries, or standard therapies like radiation or chemotherapy, which have a much broader toxic effect on a body's cells, along with a long list of side effects. The first targeted therapies are aimed at estrogen receptor-positive (ER+) breast cancer, cancer fueled by the hormone estrogen. In ER+ cancer, tumor cells have an excessive number of receptor sites for estrogen, making that hormone a "trigger" for the disease. It is the most common type of breast cancer and accounts for about 70% of newly diagnosed breast cancer cases each year. One of the most common targeted therapies for ER+ cancer is endocrine therapy, also called hormone therapy. Endocrine therapies, which aim to block the effect of estrogen on these tumors, achieve that through a variety of different modes of action. In many cases, as part of a larger therapeutic approach, these therapies can knock out the cancer. When therapies fail, there's a chance of the disease becoming metastatic breast cancer, also known as Stage 4 breast cancer, one of the deadliest forms of the disease. Stage 4 cancers have spread beyond the breast tissue into other areas of the body. Often, Stage 4 ER+ breast cancers have developed a resistance to the anti-estrogen therapies that worked before. To attempt to overcome that resistance, Sanofi has been developing a targeted therapy using estrogen receptor "degraders" intended to reduce the number of active receptors in a tumor. "Based on our pre-clinical data, and our early clinical data, we think that this could potentially be an advance for breast cancer patients," said Dr Joanne Lager, Sanofi's Head of Oncology Development, R&D. "We're quite excited about it." Researchers continue to make strides against breast cancer, and other forms of the disease, working toward both longer survival times and, eventually, cures. "There is still a strong need for new treatments, and this is where Sanofi has been focusing," said Debussche. "Biological breakthroughs are key to continue to find new treatments in this disease."